Alrighty, folks, it's been a little longer in coming this time. But I come bearing photos! I have been very busy lately, and definitely sewing up a little storm. Unfortunately, being a ripe 1:00 in the morning right now, I'm not sure how much I can post and how much I will have to save for later. But here goes, anyway! I'm posting right here the INCREDIBLE hoodie I recieved from my swap partner! She did such an awesome job, and, actually, I'm wearing it right now. It's soft and cozy inside, and the sparrows are so, so beautiful. She has stencilling skillz, man. Oops, dorky expression alert. But trust me, nobody will notice the look on my face because this hoodie really takes all the attention away from me. I LOVE HOODIES. Need I really say more? I had my first Etsy buying experience (something I really should have done long ago: I'm a seller, after all, and should understand what the transaction is like from the buyer's side of things!) recently. I have been searching for anchor-printed knit for a really long time, and finally it occured to me to search usin the Supplies section on Etsy. 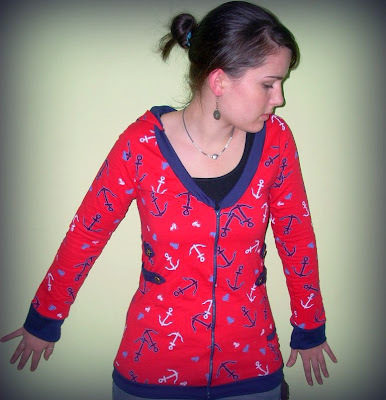 Voila: Anchor/Heart printed French terry fabric! I purchased two yards of it promptly, recieved it three days later, and two days after that I had this hoodie. When making this, I had a small dilemma. I wanted to make it a zip-up, but I had two choices in my zipper collection for seperating navy zippers: 18" flat metal, or 26" chunky plastic. I decided to work around the challenges of a shorter zipper and go for the 18 incher. 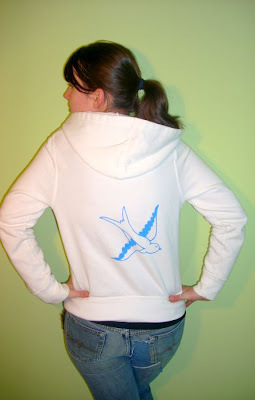 I am super pleased with the result: a scoop-necked hoodie! The hood IS on there, trust me, I just didn't post pictures with it up. It has nautical tabs on the side with anchor buttons, contrasting hood lining and trimming, and a little pocket on the side. It's comfy, super long, and definitely one of a kind. It's, um, also for sale here: www.mateycouture.etsy.com. Don't forget about the free shipping all weekend, starting midnight tomorrow and ending at 11:59 p.m. Monday. I'll be definitely posting more pictures soon! I also recieved my order from Threadless T-shirts today (www.threadless.com) --they're having this huge holiday sale with 5, 10, and 15 dollar t-shirts. Act fast, because they sell quickly. Lucky for me, sizing didn't matter so much since I'll just be cutting them up anyway, but I got four awesome shirts with beautiful artwork on them and will be reconstructing, listing, and posting them all soon! In the meantime, go check out the website.